Five o’clock rolls around, but it’s not quitting time. You’ll be lucky if you get out by six, six-thirty at the earliest. When eight rolls around, you slam your head against the keyboard because you’re still not done. It’s no shocker that Americans are overworked. 53 percent claim to be overworked and approaching the burnt-out phase (if they’re not already there). Roughly two-thirds of Americans have smartphones. While this has made communication far easier, it’s also resulted in a generation for which multitasking is a virtue. Many people believe that multitasking is the most efficient way to do things. What’s the solution? Intentionality. Rather than trying to do three things at once, focus on each one, give it the time it deserves, and you’ll find that you can get a whole lot more done. 3. Don’t allow work to take over your life. 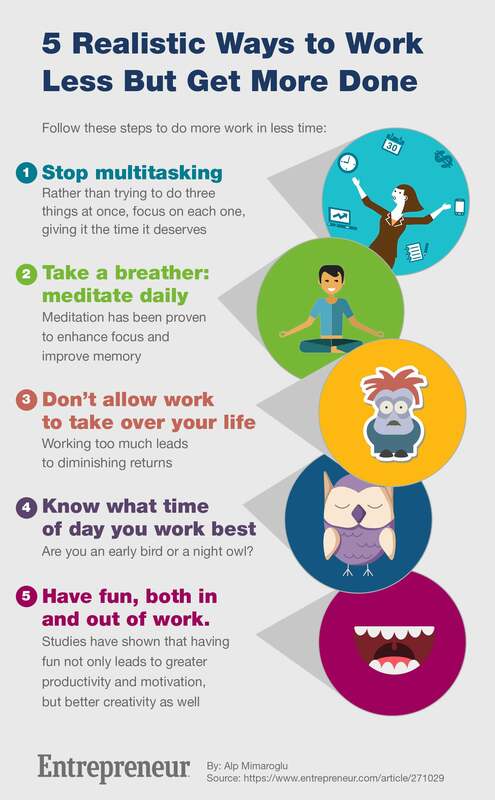 Did you know that the most productive people are those who don’t always focus on work? Sounds counter-intuitive, right? Yet people who don’t compromise their work-life balance and their hobbies are actually more productive and successful than those who do. This isn’t that surprising. Plenty of studies have shown that working too much leads to diminishing returns. Just like robots, even the biggest workaholics need to be recharged once in a while. That means setting aside some time for non-work-related pursuits. Don’t be that person. Instead, go and enjoy life when you get off work today. Not only will you have a blast -- you’ll be better at your job, too.